A coffee table book full of unfinished short stories. Anyone can pick up a pen and write the next bit. You pick up a pen and write inside. Add a little bit or a longer bit — go wherever your imagination takes you. Then pass the pen. The next person keeps the story going, riffing, joining the dots and sparking ideas, and then the next person, and so on, and so the story grows. The book is a great way to get creative together, whether just for a giggle or with the aim of stretching your imagination and lateral thinking skills. “I wrote this book because it’s fun to make stuff up together,” says Rick Benger, creator of Once Upon a Pancake. “It’s wonderful to share your imagination, try to bend and squish little stories together." There are over 100 unfinished short stories inside. It will make office coffee tables more fun and it will offer a productive break from being productive. Each story can be thought of as an exercise in collaborative creativity. To contribute, it's best to adopt a spirit of play and shake off the fear of saying something silly. Each writer will bring their own genius, skew and divergent associations. But what diverges must ultimately converge; it's a team effort, after all, and the story must end when the page does... How far to open it up before you wrap it up? 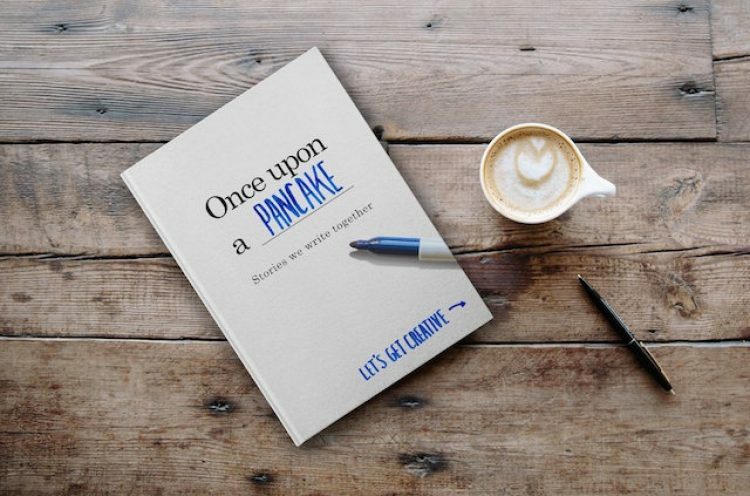 To find out more about the project, or simply to get Once Upon a Pancake book for yourself, for your family or for your business go to Kickstarter page HERE. Fiction writer, creative strategist, book collector.